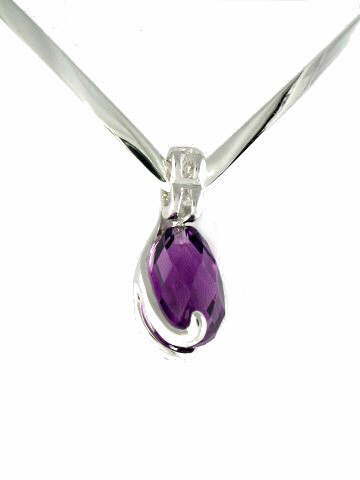 Small but elegant, this lovely Siberian Amethyst Quartz pendant features a faceted, teardrop stone mounted in an unusual design Rhodium plated, 925 sterling silver setting. This is speciality Quartz, which is lab-grown. Genuine Siberian Quartz Crystals are collected and then grown in controlled conditions in a laboratory and infused with manganese and iron, which gives them their lovely violet colour. This process produces completely flawless and pure Amethyst Quartz. Metaphysically, these stones are said to be powerful carriers of the Violet Ray, which is said to have the power to clear all karmic debt as well as to free us from physical pain. They are said to embody the qualities St Germain, Master of the Violet Flame. ‘Siberian’ is also a term often applied to gemstones of a flawless nature and of the and highest AAA grade. The colour of this gem is far more vibrant 'in the flesh' - highly recommended.